Heidi Heckelbeck had a lot on her mind. She had been spying on Principal Pennypacker for more than a week because she was pretty sure he was a witch. Why else would he have a Book of Spells in his office? At least, that’s what the book looked like. Now she just had to prove he was a witch. 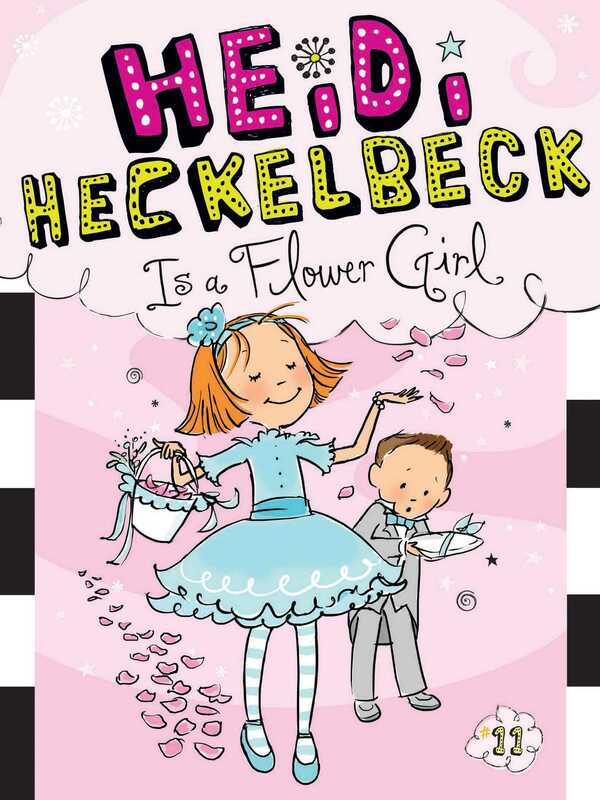 And on top of her witch detective work, Heidi had also been asked to be a flower girl in her aunt Sophie’s wedding. Aunt Sophie was Dad’s sister, and soon she was going to marry Uncle Ned in the Heckelbecks’ backyard. Well, Uncle Ned wasn’t actually Heidi’s uncle yet—not until after the wedding—but Heidi and Henry had called him Uncle Ned ever since he’d gotten engaged to Aunt Sophie. Now Heidi had to go dress shopping. Ugh, thought Heidi as she stood in the middle of Miss Harriet’s dress shop. She had never shopped for a fancy dress before. Now she was surrounded by them. Miss Harriet looked Heidi up and down. Then she sifted through the dress racks and pulled out dresses in a rainbow of pastel colors: strawberry, mint, yellow, cream, and blue. “You’ll make an enchanting flower girl in any one of these,” she said, holding the flouncy dresses in front of Heidi. Heidi frowned. I’ll look like a poofy powder puff in any one of those dresses, she thought. It wasn’t that Heidi hated dresses. It’s just that they weren’t exactly her style. She was more of an everyday girl. Heidi followed her mother into the dressing room. Then she pulled off her favorite kitty cat top and jean skirt. Heidi left on her black-and-white-striped tights and sneakers. Then she slipped a strawberry dress over her head. Mom tied the satin sash around Heidi’s waist. The dress had a scratchy skirt that stuck out like a giant lampshade. Heidi glanced in the mirror. “It looks like something Smell-a-nie would wear,” she said. Melanie Maplethorpe, also known as Smell-a-nie, was Heidi’s worst enemy. Heidi tried on another dress, and another and another. The mint dress made her look like she hadn’t slept in a week. The yellow dress made her look like a glass of lemonade. And the cream dress made her look like a miniature bride. Then Mom zipped the blue dress and tied the sash.